We’d love your help. Let us know what’s wrong with this preview of Calamity by J.D. Jordan. I’m sure you’ve heard of Calamity Jane, but this is not a novel about Calamity Jane. At least not the Jane you may have read about. Calamity Jane is part of the legends of the Wild West, but long before she scouted with Custer or “Wild Bill” Hickok, she was a fifteen-year-old girl with a fiery temper. Violence and tragedy turn young Jane’s world upside down and soon she finds herself riding with an alien gunslinger—the Green Man—through a landscape of revenge and betrayal. Along the way, she learns how to shoot a six-gun and how to stand on her own, even when surrounded by Lakota warriors, and be respected. From space ships to guns that can shoot the wings off a butterfly a mile away, young Jane realizes that the universe is far bigger than the Wild West and that she can trust no one in it to save her but herself. When the villainous Grays meddling in the wars between the Indians and the government stand in the way of the Green Man making his way home, Jane finds her desire for revenge may be less than her loyalty for the longrider. And in that realization, she becomes the hero the Wild West has long remembered. So, forget what you know of how the West was won. Forget the Indian Wars and Custer’s Last Stand. Instead, learn the truth of what happened when a young girl met a longrider she called the Green Man . . .
To ask other readers questions about Calamity, please sign up. Whenever someone recommends a book to me, I approach the task of reading it with some trepidation. Mainly because I've been on the receiving end of some lousy recommendations. But not this time. No siree! In "Calamity: Being an Account of Calamity Jane and Her Gunslinging Green Man", JD Jordan has created a work that will stay with me for a long time. His use of the vernacular is the element that captivated me from the beginning. It's no exaggeration to say that the voice of Calamity Jane is remi Whenever someone recommends a book to me, I approach the task of reading it with some trepidation. Mainly because I've been on the receiving end of some lousy recommendations. In "Calamity: Being an Account of Calamity Jane and Her Gunslinging Green Man", JD Jordan has created a work that will stay with me for a long time. His use of the vernacular is the element that captivated me from the beginning. It's no exaggeration to say that the voice of Calamity Jane is reminiscent of the way Mark Twain rendered speech in his classic novels. Jordan writes in the most authentic, beautiful, honest and captivating way. The next thing that grabbed me was the fantastic tale itself. I absolutely loved the original concept of this book. The premise of the story, a 15-year-old girl (an historical figure to boot) hitching her fortunes to a gunslinger from outer space with stalks on his head (the Green Man) is bizarre, to say the least. But I love the absurd. The absurd is wonderful. As is JD Jordan's way with language - tight, purposeful and poetic. Plenty of action in the manner of a traditional true western, lots of shootin', hog-tyin', fightin' and a' cussin'. But with the extra element of sci-fi. Highly recommend to anyone who wants to step outside the boundaries of the conventional and try something different. Five big, fat, green stars. Jordan's Calamity is VOICE, if you take my meaning. The novel is told in series of three "Books" and each of these books is one set of adventures. The narrator, Calamity Jane is telling the stories of her life to a writer who is transcibing her words for the public. This is her memoir and she is reminiscing thirty years into her past to the time the adventures took place. It's unlike any memoir I've ever read, and even though there are moments that Calamity Jane reminds us that she is telling th Jordan's Calamity is VOICE, if you take my meaning. The novel is told in series of three "Books" and each of these books is one set of adventures. The narrator, Calamity Jane is telling the stories of her life to a writer who is transcibing her words for the public. This is her memoir and she is reminiscing thirty years into her past to the time the adventures took place. It's unlike any memoir I've ever read, and even though there are moments that Calamity Jane reminds us that she is telling this from a distance, it is told with such immediacy that you are caught on her every move. Jordan captures the reader and takes us on a gritty journey through the dusty landscape of the American West, and in the end you'll thank him for the ride. Calimity is far and away the most creative work of fiction I have read in years. It is incredibly imagined, beautifully rendered, and hauntingly real. Calamity Jane herself is a fine mix of insecurity, fierce spirit, audacity, tenderness, tenacity, love, and hate. She is fifteen in the tales, orphaned and alone in the world when her path crosses with the Green Man, who is, believe it or not, not the first green man she has encountered. When her world is tumbled to dust she hitches her fate to the Green Man and they set out together. Martha Jane Canary is a fierce little bird and in this tale she transforms, shedding the childhood fears along with the name she associates with those weaker moments. She takes Jane as her nomiker and reminds herself always to be strong, not a Martha, which always made me realize what a young girl she was during this story. The voice of his scifi / western is so compelling and original and unique! You'll be drawn into the action from page one as you journey alongside young Calamity Jane through the perils of the old West, with a hell of "green" sidekick who sometimes helps her out of trouble and sometimes helps get her into it. This book was like nothing I've ever read, and I LOVED it. It's a brilliantly imagined adventure crossed with a story of trust and faith and all the things of the universe we think we understand but don't - there's action and humor and pathos...so much heart in these pages. Do not miss this jewel of a book. Calamity is a Wild, Weird West version of the story of Calamity Jane, “Being an account of Calamity Jane and her gunslinging green man.” Her “green man” is an alien, one of two species visiting earth, and he has antennae and huge eyes, odd powers, and rather better strength and reflexes than humans. He’s also a dead shot, and wants off earth while dishonest humans want his tech—especially the space ship he plans to travel home on. When something happens to that ship, something also happens to Ja Calamity is a Wild, Weird West version of the story of Calamity Jane, “Being an account of Calamity Jane and her gunslinging green man.” Her “green man” is an alien, one of two species visiting earth, and he has antennae and huge eyes, odd powers, and rather better strength and reflexes than humans. He’s also a dead shot, and wants off earth while dishonest humans want his tech—especially the space ship he plans to travel home on. When something happens to that ship, something also happens to Jane, and she tags along...and eventually becomes his partner, a fellow longrider, and a dead shot who can more than take care of herself. The novel is presented in three books where she recounts her adventures to a newspaperman, but you quickly get lost in the first person nature of her fights for survival and for her Green Man, to help him get off earth. I devoured this in one sitting, and I’m not even fond of Westerns. Every single western cliché you’ve ever read gets turned on its head, but it does not feel like artifice. It feels very real: a hell of a trick for the author to pull off in his debut novel. 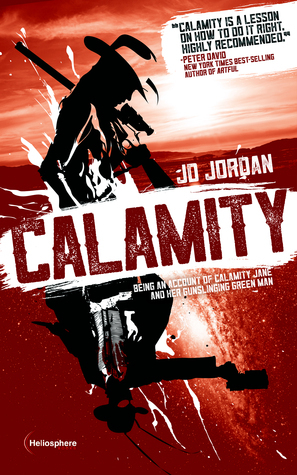 J. D. Jordan's debut novel, Calamity: Being an Account of Calamity Jane and Her Gunslinging Green Man, is an interesting piece of speculative fiction, because it combines science fiction and western elements in an original and enjoyable way. It's an intriguing glimpse into the early life of Martha Jane Canary, who is better known as Calamity Jane, because it reveals what happened to her when she met an alien gunslinger and longrider called the Green Man. I'm s Originally published at Risingshadow. I'm sure that all of us have heard of Calamity Jane and know who she is, because she is a well-known figure of the Wild West, but none of us have ever had an opportunity to read about her early life in a speculative fiction format. This novel offers readers a totally new perspective to her life, because the author's vision of her early years is refreshingly inventive and different from what actually happened in her life. J. D. Jordan's Calamity is an intriguingly gritty novel that offers plenty of entertainment to readers who enjoy western stories. I have to admit that I was amazed by this novel's entertainment values, because the story was good and the characters were interesting. This novel is one of the most interesting reading experiences I've had in a long while, because it's something different due to the author's bold reinvention of Calamity Jane's early years. - The story is narrated by Calamity Jane and is divided into three parts: 'Seeing The Elephant', 'Someone To Ride The River With' and 'A Man For Breakfast'. This is the beginning of a story that reveals how Martha Jane Canary becomes Calamity Jane and learns many things. It's a slightly different kind of a coming of age story. The story grabbed hold of me and made me want to read it as fast as possible. It was interesting for me to read about what happened to Jane, because the author wrote fluently about her life and feelings and avoided sentimental and melodramatic moments. The story was wonderfully seeped in rough and unforgiving realism that highlighted the harsh conditions of the Wild West. The characterisation works well, because J. D. Jordan gradually reveals information about Jane and the Green Man. Both of the protagonists are fascinatingly rough around the edges and have flaws and traits that make them realistic. Martha Jane Canary aka Calamity Jane is a strong-willed and fiery-tempered young woman who has quite an attitude. She's been alone for a while and has had to take care of herself. Although she lets people see that she is tough and can take care of herself, she has an insecure side to her that she keeps hidden from others. She has a lot to learn, because she finds out that she can trust no-one but herself. The author has given Jane a bold voice, which is filled with youthful rage, roughness, wittiness, inexperience and insecurity. He makes Jane a believable person by writing boldly about how she tries to survive in a hostile world where life is cheap and how she transforms from Martha to Jane. The Green Man is a tall alien man with antennae on his head. He's a cold-hearted person who's rough around the edges and doesn't treat everybody kindly, because he doesn't think highly of people. He can use his powerful voice as a mighty weapon to make men cower before him. The author writes intriguingly about him from Jane's perspective, because Jane witnesses what he does and how he deals with different situations and problems. Jane and the Green Man have quite an unusual bond and relationship between each other, because they're independent persons who have been thrown together by brutal and violent circumstances. They're different yet strangely similar in certain ways and try to tolerate and overlook each other's habits and traits. I was surprised to see discrimination and prejudice mentioned in this novel. The author wrote well about how the green men are being treated, because they're different from human beings. Because they've come from space and look different, they're often treated badly and are not considered equal to men. I found it fascinating that there are also Grey Men in this novel. I won't go into details about them in order to avoid writing spoilers, but I can mention that there's little love lost between the Grey and the Green men, because they're different from each other. These alien men added plenty of fascination to the story, because you don't often have an opportunity to read western stories that feature aliens. When I read this novel, I got the impression that J. D. Jordan is fascinated by western stories, films and TV series, because he wrote convincingly about western elements and paid attention to building an intense atmosphere. I'm sure that this novel will strike a chord among readers who have read westerns and who are familiar with the film Cowboys & Aliens, HBO's Deadwood and AMC's Hell on Wheels, because it has a few things in common with them. I look forward to reading what J. D. Jordan writes next, because this novel was something different and I enjoyed reading it. I sincerely hope that he continues to write this kind of fiction, because he has a gift for it. J. D. Jordan's Calamity is a satisfyingly gritty, intense and entertaining novel that deserves the attention of speculative fiction readers who enjoy reading fast-paced western stories. It's something different, because it offers a fascinating glimpse into the early life of Calamity Jane by shedding light on her comradeship with an alien gunslinger. It's quite an extraordinary sci-fi western romp. JD Jordan's ability to write in the voice (and feel) of a female character is beyond amazing! I COULD NOT put this book down! Westerns and sci fi were not my niche - but thanks to JD I am hooked...as long as he keeps writing them that is! I loved the vernacular and the story arced in all the right places. I'm so eager to read more about the Green Man...to be honest I'm eager to read anything else by this amazing new author!! The story we all know of Calamity Jane is not what we think. This story follows Calamity as a 15 year old girl and her alien side kick. When tragedy strikes close to Jane she begins a journey of revenge with her sidekick alien. This fun sci-fi western goes from the wild west to guns and star ships. On this adventure Jane will discover her true feelings for revenge vs loyalty, as the reader discovers how the west was really won. What a fun read! Definitely worth the commitment. From the beginning you're introduced to Calamity Jane as a young, naive girl. She's complex, opinionated, and fiery. As an older, more seasoned woman, telling her own story—how she grew from one Martha Jane Canary to the legendary Calamity Jane—she owns who she was, and what she did during her time with the Green Man, a man from another world playing cowboy to survive in the American West. Usually when a male author writes in a female voice, it fai What a fun read! Definitely worth the commitment. Usually when a male author writes in a female voice, it fails. Jordan delivers with Jane. What I love about this character is that she's strong-willed, flawed, and self-aware. She rides with the Green Man, a character who is obviously deep, but remains a mystery. Something that frustrates Jane as much as it would frustrate me. But that's part of the magic in Calamity. The action is constant and surprising, much like a Harry Dresden novel. And the Western dialect, though hard to parse at first, will transport you to another time and place and you'll be speaking cowboy in your head while doing the dishes. Think Firefly or Tombstone. Wow. This debut novel by author J.D. Jordan is some good readin'. This western with a sci-fi twist was a new genre for me! I honestly didn't know what to expect or if I would enjoy reading a western. But I was VERY pleasantly surprised. I did have to google a few of the phrases from the wild west I was unfamiliar with, which was an adventure in and of itself. It totally helped me feel connected to Martha Jane's story and feel like I was right there in Wyoming with her and her Green Man. You can a Wow. This debut novel by author J.D. Jordan is some good readin'. This western with a sci-fi twist was a new genre for me! I honestly didn't know what to expect or if I would enjoy reading a western. But I was VERY pleasantly surprised. I did have to google a few of the phrases from the wild west I was unfamiliar with, which was an adventure in and of itself. It totally helped me feel connected to Martha Jane's story and feel like I was right there in Wyoming with her and her Green Man. You can also visit the authors Facebook page where he has posted many of the definitions of the common phrases used back in the old west that are included in the book. I'll eventually come back to this. I stopped at page 115. I think it's the fact that everything is purposefully grammatically off, prose and dialogue, that made it hard for me to read. Because I notice errors in hardcover books that had editing. I know it's the style for the book and main character but it was too jarring for me when I had to reread sentences and auto correct in my head before continuing to read. So this is a did not finish book for now. This book is very well-written and so original. Highly recommended! Nohing wrong with this book, but it just wasn't me. Solid three stars, more if you like westerns. More of a tall tale than SF since the aliens/weapons just are (no science, etc). I heard J.D. Jordan speak at RavenCon 13.5 on an AU panel, and his intellect and presentation immediately sold me his book. I knew I wanted to read what he wrote before he even finished speaking. As Jeff Noon might have done, Jordan drops you into Jane's world and expects you to keep up with the slang and pace. He captures both tenderness and bombast with equal skill. You'll want to read this. Loved this book! The voice of Martha Jane Canary telling her story is simply fabulous. You fall in love with the characters, are invested in their future, cry when they are hurt and hoot n’holler when they win. A crazy little ride through familiar territory I did not want this book to end! Great Ride ! Won my copy from giveaway on GoodReads . JD Jordan lives in Atlanta, Georgia with his wife, Ellie, and a whole bunch of kids. He’s a huge scifi nerd but, despite the contents of this novel, never purposefully sat down to watch or read a Western until the Green Man rode into his imagination. Now he can’t get enough of them. Calamity is his first novel. You can find sample chapters, a companion story, a guide to Jane's calamitous saddle slan JD Jordan lives in Atlanta, Georgia with his wife, Ellie, and a whole bunch of kids. He’s a huge scifi nerd but, despite the contents of this novel, never purposefully sat down to watch or read a Western until the Green Man rode into his imagination. Now he can’t get enough of them.